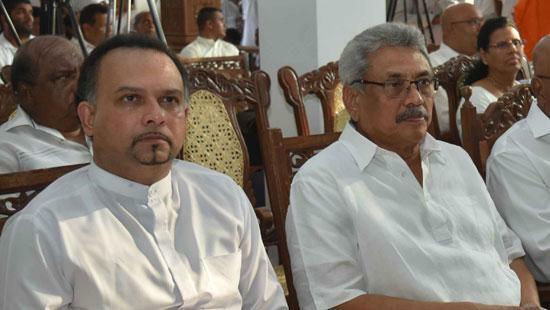 Plantation Minister Navin Dissanayake called former defence secretary Gotabaya Rajapaksa a future presidential candidate while Mr. Rajapaksa in his subsequent speech referred to Minister Dissanayake’s father-in-law Speaker Karu Jayasuriya as a promising candidate for presidency. The duo expressed these views at an event held on Wednesday at Sri Gautama Viharaya in Narahenpita. Prior to handing over the stage to Mr. Gotabaya, Mr. Dissanayake swiftly said Mr. Gotabaya was a future presidential candidate occupied with a hectic schedule. “It is only with the Sinhala Buddhist votes that a government could be formed or toppled. We fervently believe the right person will be given the deserving position,” he said. On the other hand, Mr. Rajapaksa said he was thankful to Mr. Dissanayake for calling him a presidential candidate. “I hope you will accomplish what your father could not. I wish you all the very best. However, I know for sure that your father-in-law will be a presidential candidate,” he said. Gota may be efficient, but he is also an ultra nationalist and who doesn't hesitate to resort to terror tactics to achieve what he wants. Hopefully we are a more civilised nation which won't buy into that type of "leader"! Ranil nowhere in the equation; as usual. Is this a threat to UNF from Navin to say that if anyone other than the Speaker is given the ticket to contest the Presidential election he is going to support Gota? Looser can't be good choice, Navin is wrong again wait until the real winner is emerged very soon. gota fled the country when he was in the army from us he came back when mr was the president,from behind the curtain he is a hero...no ..no..how much of government money he has played out,he is not fit to be any leader. Please take note that Gota Rajapaksha will be no match to Maithreepala Sirisena on a political stage.